to gain a good working knowledge and some competence in Project Management, able to manage the process and the project team. to gain membership of the APM, as an ordinary member [MAPM]. The course is structured in two parts, which we call Blocks. Each Block combines classroom time and distance learning. At the end of the two blocks you will have a firm foundation and sufficient depth of knowledge to have confidence in your understanding of project management. The overall length of study is two to three months. For the duration of the course tutors will be available to help and guide you. 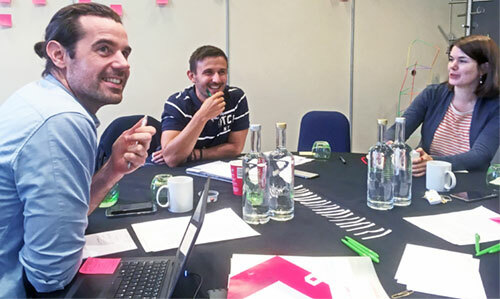 The two Blocks cover the syllabus for the APM’s Project Management Qualification (PMQ) and prepares students to for the PMQ exam which leads to Membership of the APM (MAPM). Students who wish to take the PMQ exam should also attend Block 4, the one day exam preparation and revision session. to become truly competent in Project Management, managing the process and lead the project team in a professional, skilled way. Those who wish to gain membership of the APM, at a higher level as a Chartered Member [ChPP]. This course provides Block 3, and builds on the principles and tools learned in Blocks 1 & 2 covered by the Certificate of Construction Project Management course. By focusing on the further development, integration and application of these, it takes learning and competence on to a higher level. Block 4 is a one day exam revision and preparation session for those wishing to take the APM exams. 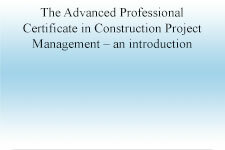 It also covers the application process for the Chartered Project Professional standard (ChPP). This learning is accredited by the APM in relation to the PPQ exam level. On satisfactory completion of each block you will be awarded a Certificate of Achievement.